Nissan has announced that it has entered into a definitive sale and purchase agreement with private investment fund GSR Capital (GSR) for the sale of Nissan’s electric battery operations and production facilities. 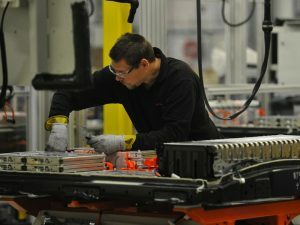 The agreement covers Nissan’s battery subsidiary, Automotive Energy Supply Corporation (AESC) – founded in 2007 to develop advanced lithium-ion batteries – and battery manufacturing operations in Smyrna, Tennessee and Sunderland, England. Assets sold to GSR will also include part of Nissan’s Japanese battery development and production engineering operations located in Oppama, Atsugi and Zama. Reassuringly, Nissan has stated the workforce at all facilities covered by the deal, including the production plants, will continue to be employed. The headquarters and development centres will remain in Japan. Nissan has implemented the transaction by first buying the minority 49% stake in AESC currently held by NEC Energy Devices Ltd (NECED). However, NEC has approved the sale to GSR. Today’s announced transaction is subject to normal consultation with staff representative bodies and, pending regulatory approvals, is expected to be completed by the end of December 2017. The transaction is contingent on GSR concluding purchase of all NECED shares from NEC. Financial terms have not been disclosed.